Russian Federation President Vladimir Putin (above). To negotiate with Putin, US President Donald Trump and his advisers recognize that it is important to look well beyond his statements and optics and fully grasp what he wants. Putin seems to have Russia sitting on Ukraine and moving at a deliberate pace on the Minsk peace process. Moving slowly on the peace process has given him an upper hand to a degree, as other parties involved are required to respond to his whims. The Trump administration will unlikely tolerate that. New options are likely being developed. The ideal geopolitical response to the global power crisis is a connection between US, and Russia. In 2017, the foreign policy efforts of the administration of US President Donald Trump evinced a desire not to isolate Russia, or allow engagement with it to fall off. He does not want to settle on a long-term stand-off in which peace, particularly in Europe, is placed at risk. He believes the US and Russia can be good neighbors on the same planet. Zbigniew Brzezinski, the renowned US foreign policy scholar and former US National Security Adviser, stated that sophisticated US leadership is sine qua non of a stable world order. Finding a way to establish an authentic positive relationship with Russia is a struggle US administrations have engaged in for a few decades. Trump said he would try to find the solution, and explained that he would give it his best effort. However, critics depicted Trump as being a naïve neophyte, outmatched by Russian Federation President Vladimir Putin. They warned of the dangers of Trump dealing with the sly, experienced Russian leader. Still, there is a greater reality about the entire situation. While the Trump administration remained outwardly positive about working with Putin, it was not in fact overly optimistic about that. Trump and foreign and national security policy officials in his administration were always well-aware of the fact that Putin and his government can more often than not be disingenuous. Yet, Putin is the duly elected president of Russia, and its head of state. Moreover, for now, Putin is the best leader available to keep Russia’s complex society somewhat stable. He has managed to contain extremist political elements that might seek war with Russia’s neighbors, NATO, or the US directly without thinking it through and he has suppressed morally void organized criminal elements that might wreak havoc globally. Map of Ukraine (above). Moscow views Ukraine as being part of its sphere of influence, its “near abroad”, and its hope would be to bring it into Russia’s fold, willing or unwilling. The US and other Western powers support Kiev’s desire to be an independent actor. Long before the mass protests in Kiev began in 2014, circles there were quite pro-Western and welcomed entrées from the EU to take a westward path. However, as the US and EU responded to the Russian occupation of Crimea, another crisis arose in the east of Ukraine, in a region known as Donbass. Pro-Russian separatists in its Donetsk and Luhansk provinces took over entire towns and declare the independence of the territory captured. 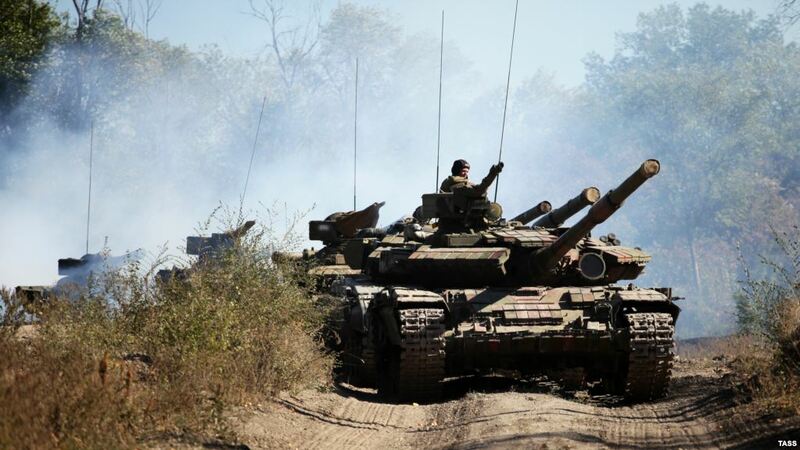 The Kiev government has sent the Ukrainian Army into those region to reclaim its sovereign territory. The provinces would eventually declare themselves independent states: the Donetsk People’s Republic and the Luhansk People’s Republic. Western officials insist that Russia has actually been controlling both the civil administration of the self-proclaimed countries as well as the fighting. The Minsk Agreement was intended to create a ceasefire, yet thousands of violations were committed by both sides on a daily basis. The combatants have maintained fighting positions too close to one another. Tanks, mortars, artillery, and multiple launch-rocket systems could be found where they should not have been. Civilians living near the fighting have suffered greatly. 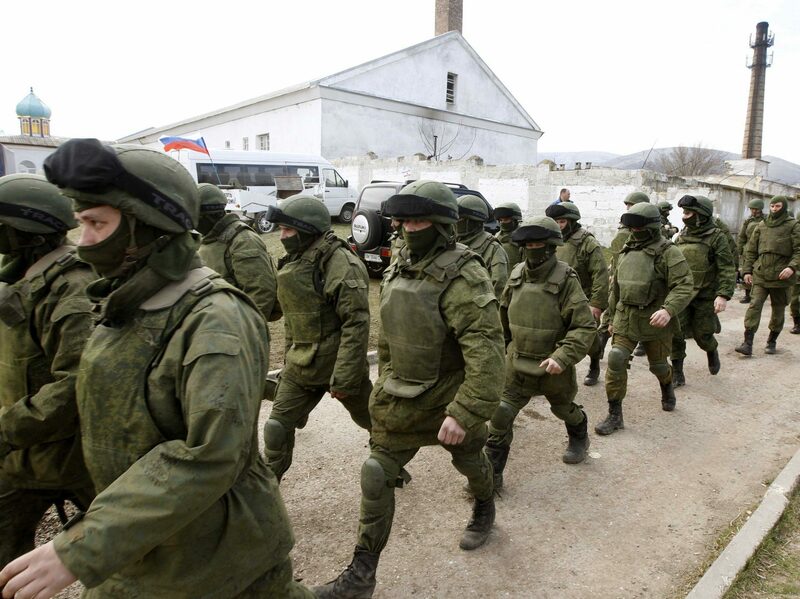 Russian Federation “green men” in Crimea, 2014 (above). Soon after Ukrainian President Viktor Yanukovych fled to Russia. Putin, perhaps anticipating his fall or simply implementing Moscow’s version of a nuclear option on Ukraine, rushed into Crimea with unidentifiable “green men”, military forces mainly from the VDV and GRU. They claimed to be Crimeans. In only a matter of days, Crimea was under Russian control. Nulla res carius constat quam quae perilous empta est. (Nothing is so expensive as that which you have bought with pleas.) Under the Minsk Agreement, Ukraine, the Russian Federation, France, and Germany on February 11, 2015, agreed to a package of Measures to mitigate and eventually halt the conflict in Eastern Ukraine. It was a follow-on agreement to the unsuccessful Minsk Protocol, which was crafted to halt the war in Eastern Ukraine and was signed by the Russian Federation, Ukraine, the Donetsk People’s Republic and the Luhansk People’s Republic on September 5, 2014 under the auspices of the Organization for Security and Cooperation in Europe (OSCE). 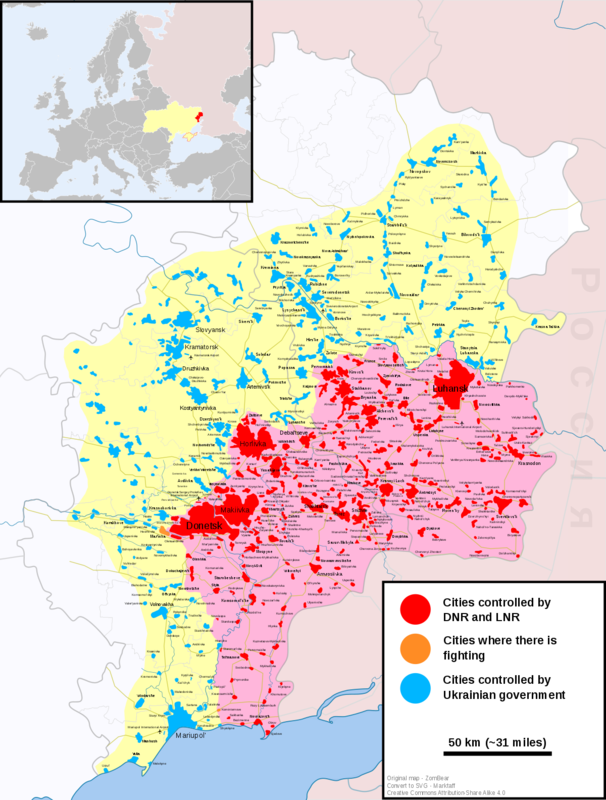 The Minsk Agreement’s terms included: an immediate ceasefire; a buffer zone separating heavy weapons of both sides, with a minimum buffer zone of 50km for 100mm artillery and up to 140km for rockets; effective verification by the OSCE; amnesty and release of all hostages and illegally detained people; safe access, storage, delivery, and distribution of humanitarian aid to the needy; restoration of government pensions and other welfare payments for civilians in the east; the restoration of Ukrainian control of the banking system in areas affected by the conflict, pull out of all foreign military formations, military equipment, and mercenaries from Ukraine under OSCE monitoring; the disarmament of illegal groups; full Ukrainian control over the eastern border, after local elections under Ukrainian law. There was supposed to be a constitutional deal on the future of Donetsk and Luhansk by the end of 2015 but that went nowhere. The direction which the region may turn will be determined either by the US, EU and Ukrainian Government, intent to keep all of the Donbass in Ukraine, albeit with part of its population reluctant to live under Kiev’s control or by Russia and pro-Russian separatists intent on establishing the region’s independence and tying it umbilically to Moscow. From the additional space in Ukraine he holds, Putin can exert his influence in the region. Map of Fighting in Eastern Ukraine (above).The direction which Eastern Ukraine may turn will be determined either by the US, EU and Ukrainian Government, intent to keep all of it in Ukraine, albeit with part of its population reluctant to live under Kiev’s control or by Russia and pro-Russian separatists intent on establishing the region’s independence and tying it umbilically to Moscow. From the additional space in Ukraine he holds, Putin can exert his influence in the region. Russian Federation Foreign Minister Sergei Lavrov (above). 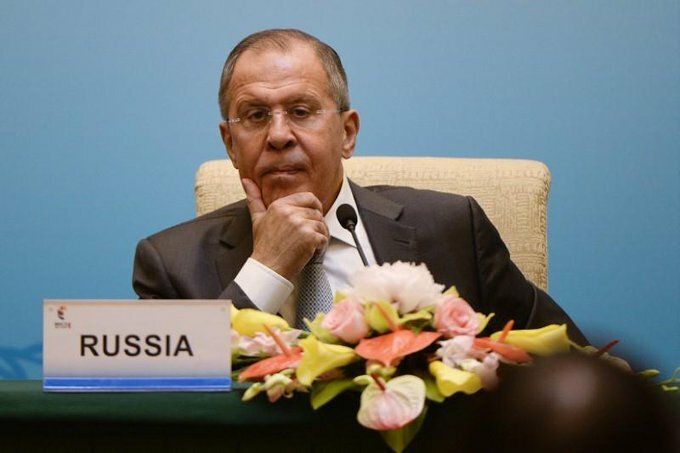 During a Moscow news conference on January 15, 2018, Russian Federation Foreign Minister Sergei Lavrov summed up Moscow’s thinking on Ukraine. Lavrov explained that on a political level, Russia respects the territorial integrity of Ukraine but only within the boundaries that were designed after the referendum in Crimea and its reunification with the Russian Federation. 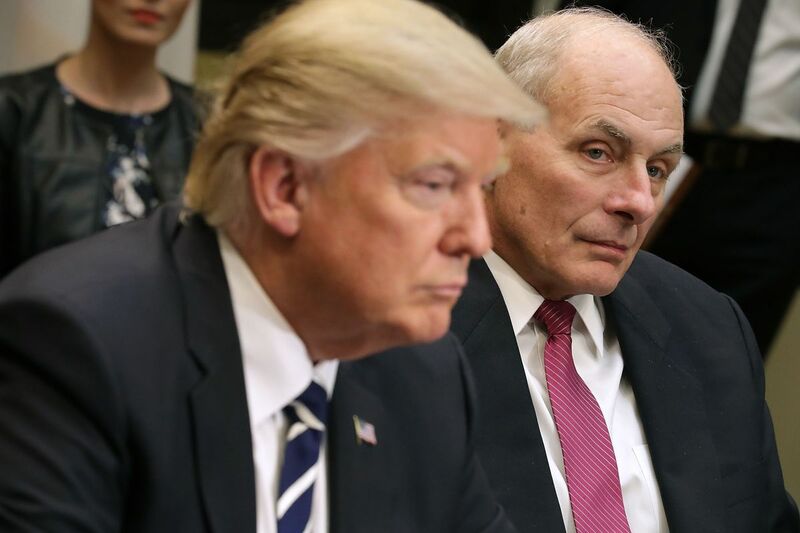 Trump (left) and White House Chief of Staff John Kelly (right). Trump and his advisers have not naively underestimated Putin. The possibility that Putin would not make himself available for deals that would lead to resolutions of disputes and contentious issues that would satisfy the administration was undoubtedly among the big “what ifs” administration officials considered and planned for. Trump and those who could be called the “stone hearts” among his officials have not been surprised by anything Putin has done. Praemonitus, praemunitus. (Forewarned, forearmed.) The Trump administration came into office eager to engage Putin in order to improve relations, but did so with its eyes wide open. Trump’s vision and pronouncement of his intention to engage was wrongly viewed as a pro-Putin deference. Critics predicted disaster if Trump attempted to negotiate on things he did not really understand with the cunning, ruthless Russian leader. Trump also received words of caution about Putin from Members of Congress from his own Republican party. The repeated warnings remind of Act II of William Shakespeare’s The Life and Death of Julius Caesar, in which Caesar dismissed information concerning the conspiracy against him. He rebuffed Calpurnia pleas that he “not stir out of his house” on the Ides of March. He rejected augurers’ claim that the discovery that an animal sacrificed as an offering had no heart was a warning sign. In Act III, Caesar ignored a letter from Artemidorus outlining the conspiracy and identifying the conspirators, and a few lines further down, he was assassinated. The possibility that Putin would not make himself available for deals with Trump that would lead to resolutions of disputes and contentious issues that would satisfy the administration was undoubtedly among the big “what ifs” administration officials considered and planned for. Trump and those who could be called the “stone hearts” among his officials have not been surprised by anything Putin has done. They would hardly be naïve and sentimental about any US adversary or competitor, let alone Russia. Honesta enim bonis viris, non occulta quaeruntur. (Honorable things, not secretive things, are sought by good men.) The jumping off point for attempting to establish better relations with Russia inevitably became getting clarification and reaching some resolution of the issue of Russia’s meddling in the 2016 US Presidential Election. The Trump administration wanted answers due to its own concerns and wanted to respond to crushing domestic pressures to find out what happened. 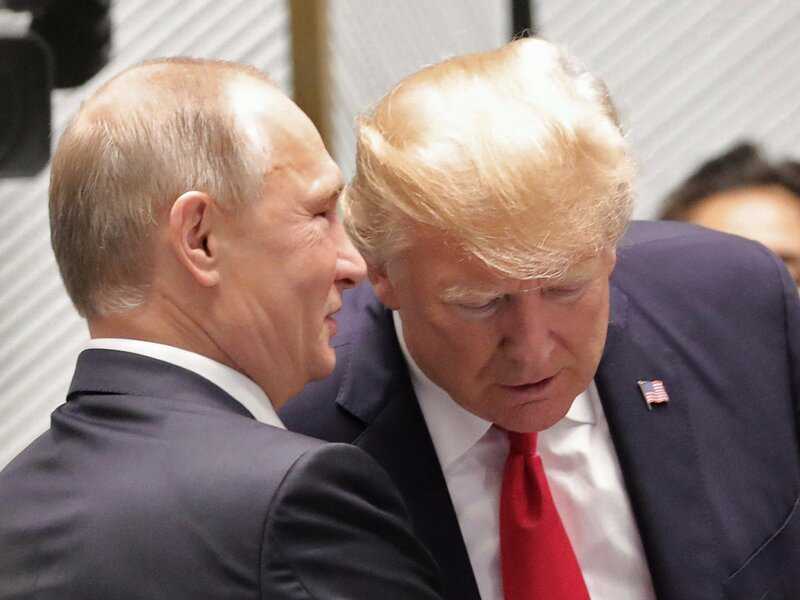 Putin was approached by Trump about the 2016 US Presidential Election meddling and the the possibility of rebuilding US-Russian relations and possibly creating a new era cooperation. If things had gone well, the stage would have been set, for better or worse, to move along the road from forgiveness,to acceptance, to restoration, and then rejoicing in Washington and Moscow. However, as sure as when the rain falls from the sky it hits the land, Putin would only offer denials about the meddling. Nevertheless, Trump listened very closely to Putin’s positions and ideas, and developed an understanding of his way of thinking. From those face to face contacts, Trump undoubtedly assessed that getting things done with Putin would require discerning misinformation, maneuvering past distractions, and driving to the heart of matters from which opportunities, open doors, could be found..
On Ukraine, the Trump administration clearly understood that provocative actions would have destabilized an already fragile situation. In addition to Trumps talks with Putin, there have been multiple talks between Tillerson and Lavrov during which Ukraine has been discussed in a fulsome way. Trump has left no doubt that he wanted Russia to leave Ukraine alone, and that is the position that the Russians are hearing from him, Tillerson and all other US officials. Trump gave foreign policy speech in Warsaw that made clear his administration’s objectives and principles. The Trump administration reaffirmed its support of Ukraine. Yet, even before that speech, Russian officials had begun to make claims that Trump’s words and actions were the causality for its attitude and behavior toward the new administration. Putin is clearly a clever tactician, but it is unclear whether he is equally shrewd strategist on the global stage. He has served as Russia’s leader as president and prime minister, one could discern through his expressed concepts and intentions, as well as his actions, that he may be leading Russia in retrograde toward the past, albeit In his effort to maintain his grip on Russia, Putin has resurrected the old systems to control the populace with which he grew up with and is most familiar. That has essentially dragged systems in Russia back to a simulacrum of the Soviet-era domestically and Moscow’s sort of neo-Cold War approach geopolitically. Still, while armed to the teeth with nuclear weapons, Russia may no longer have the capability to be flexible militarily and may be unable to be a decisive superpower in the world. In two earlier posts, “Military Leaders Discuss Plans to Counter ISIS Beyond the Battlefield: While the West Plans, Russia Conquers ISIS in Syria” and “How Russian Special Forces Are Shaping the Fight in Syria: Can the US Policy on Syria Be Gauged by Their Success?”, greatcharlie mistakenly assessed that Russia entered the war in Syria determined to shape the war on the ground and the war’s ultimate outcome given the military power it brought to bear on the problem and the sense of exigence expressed by Putin when he declared that Russia needed to act. Putin emphasized that Russia would attack ISIS, eventually driving it and other Islamic militant groups from Syria, and restoring Assad’s control over the country. That was not the case. Over time, it became clear that Russia lacked the capability to do that despite appearing to have the capacity. Russia also demonstrated a lack of will or desire to do more and to increase its presence in Syria to enable its forces to act decisively. Perhaps one could glean much from what has happened in Syria to examine and assess Putin’s efforts in Ukraine. Despite any shortcomings observed in Russia’sees military performance in Syria, there can still be no doubt that it can still effecrively act as a divisive power. To that extent, Putin has tasked the Russian military and other security services with mission of eroding existing and burgeoning democracies wherever they sees them. Indeed, as the EU and NATO expanded eastward, Putin decided to pull independent countries that were once part of the Soviet Union back into Russia’s orbit. With the help of the military and security services, Putin would create something that did not preexist in many of those countries: ethnic-Russian communities forcefully demanding secession and sovereignty. That process usually begins with contemptuous murmurs against home country’s identity, language, and national symbols and then becomes a “rebel yell” for secession. It was seen in Nagorno-Karabakh in Azerbaijan, South Ossetia and Abkhazia in Georgia, Transnistria in Moldova, and more recently in Crimea, the Luhansk and Donetsk in Ukraine. Each time an ethnic-Russian space was carved out of a country, Putin gained a base from which he can exert his influence in that country. Still, despite the activities and some successes of pro-Russian political elements, in the larger territories of those former Soviet republics occupied by Russian Federation armed forces and elsewhere in the sphere of the former Eastern Bloc, political thinking of the people of those countries has not turned in agreement with Russia. Russian tanks withdrawing from Ukraine (above). Mistakenly, greatcharlie assessed that Russia entered the war in Syria determined to shape the war on the ground and the war’s outcome given the military of power it brought to bear on the conflict and exigence expressed by Putin when he declared Russia’s need to act. Over time, it became clear that Russia lacked the capability to act decisively, although appearing to have the capacity. Russia also lacked the will or desire to do so. One might infer much from this with regard to Putin’s efforts in Ukraine. Where is Russia Really Going with Ukraine? Vera gloria radices agit atque etiam propagatur, ficta omnia celeroter tamquam flosculi decidunt nec simulatum potest quicquam esse diuturnum. (True glory strikes root, and even extends itself; all false pretensions fall as do flowers, nor can anything feigned be lasting.) Many Western military analysts have proffered that Putin’s moves in Ukraine would certainly be followed by many more, to reclaim former Soviet republics and more. Along with the capture of Crimea, Abkhazia, South Ossetia, Transnistria, Putin’s determination to hold on in Eastern Ukraine served to substantiates such concern. From everything observed, Putin wants to make Russia better. Yet, it is unclear how Putin’s approach on Ukraine fits into his plans to make Russia better. It is unclear how Russia’s capture of Donetsk and Luhansk would do for Russia in any real respect. As mentioned earlier, despite his shortcomings, he is the best authentic option available to lead Russia for now. Putin restored order in his country after the internal chaos of the 1990s. It was perhaps his initial career as an officer in the Soviet Union’s Komitet Gosudarstvennoy Bezopasnosti (the Committee for State Security) known better as the KGB, that made reestablishing the power of the state a central part of his efforts. (The KGB was the Soviet agency responsible for intelligence, counterintelligence, and internal security.) Putin has been a figurative mother to Russia, nurturing it in the best way he knows how. That idea might face some disapproval from Russian citizens who feel shortchanged of their civil and human rights, as well as opportunities to fulfill their ambitions, and feel burdened by anxieties. Still, whenever, the metaphoric waves have gotten higher, Putin has kept his ship, Russia, right and steady. Putin and a Moscow seem to be still playing the great power game in Europe, and happy to play it alone. To an extent, that would support assessments by analysts and scholars in the West who believe Putin sees everything in terms of conspiracy. It may be that the Obama administration’s approach to Ukraine and other former Soviet republics irked Putin to the extent the he is now swinging after the bell colloquially. He may be stirring difficulties due to political expediency, soothing hardliners political elements at home. It is not completely clear why rather than seek agreements and what he feel are advantages from contact with the US, Putin seems determined to get into a scrap with the Trump administration. If Donetsk and Luhansk were left in the hands of pro-Russian elements, it is questionable whether Russia would become stabilizing force in region along with its newly formed, Russia would be taking on a new, difficult situation akin to those in its Southern and North Caucasian provinces. Any resistance, peaceful or violent, would likely be dealt withh eavy handedly by Russia and its allies. Hopefully, Moscow would not assist security elements of the help Donetsk People’s Republic and Luhansk People’s Republic cleanse their new provinces of “troublemakers” or “non-citizens”. Reconstruction in the Donetsk People’s Republic or the Luhansk People’s Republic would require a lot from Russia. Donetsk and Luhansk were net consumers of foreign imports and dependent on Russian gas before the conflict began. They sit in a region that is considered a rustbelt, needing to be refitted at the cost of billions of dollars Moscow may never have. Reconstruction in Eastern Ukraine will be another huge hurdle for Russia to overcome if its “pro-Russian allies” seceded and became Moscow’s “partners.” Lacking any significant resources from the US and the rest of the international community to rebuild, the only viable long-term goal in Moscow would be to convert the Donetsk People’s Republic and the Luhansk People’s Republic into versions of South Ossetia, Abkhazia, Transnistria. It would likely receive the recognition of very few countries, Russia’s allies, but not the US or major powers of Europe. The two quasi-countries would in many ways be shut off from the rest of the world. and may never see a postwar economic upturn. Observing the effects of few months of rain and wind on the ruins of cities and towns, Moscow might recognize that it truly cannot support them in a way that would allow for their rebuilding. An authentic assessment will be left to the economic experts, but there undoubtedly will be a great additional strain on Russia. The situation would only worsen if pressure was placed on Russia over Ukraine through future sanctions. Ultra posse nemo obligatur. (No one is obliged beyond what he is able to do.) Putin very likely has considered what Russia would be like after he, as one might presume he accepts, is called to heaven. It would seem that now while on Earth, he is doing much to saddle future generations of Russians with two economically impoverished basket cases that they will need to care for, to pay for. Future generations may not appreciate that. In Donetsk and Luhansk, future generations might abandon their homelands for “the other Ukraine” or points further West. They might pour into Russia, for employment, a “better life.” In the future, a Russian leader might very well try to reverse what Putin is attempting in Ukraine due to financial strains caused. Taking on Donetsk and Luhansk might very well be a great miscalculation, another step toward sealing Russia’s fate as a second tier superpower. Perhaps the type of success Putin really wants for Russia out of his reach, not by some fault of his own, but rather because it’s problems are so heavy, may run too deep. He may have run out of real answers to put Russia on real upward trajectory given the capabilities and possibilities of the country using all tools available to him. In a significant endeavor, there is always the potential to become lost. To that extent, consciously or unconsciously, Putin may simply be procrastinating, postponing an authentic look at the situation. 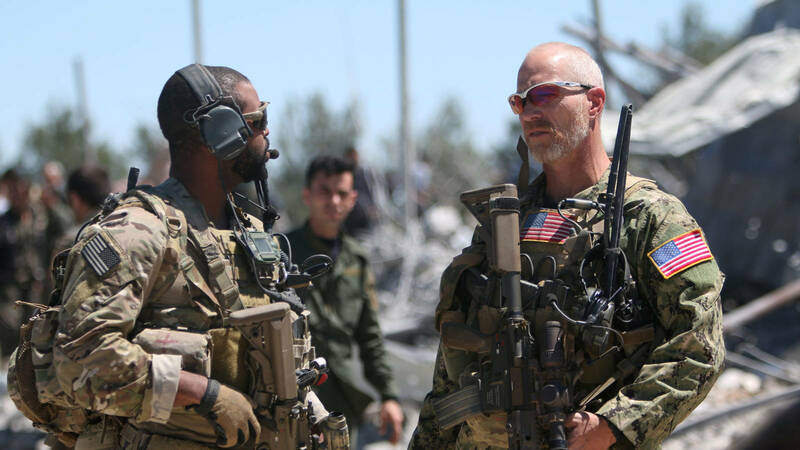 US Special Operations troops in Syria (above). The success that the US found in rallying the Syrian Democratic Forces against ISIS and other Islamic militant groups, as well as its success across the border with the Iraqi Army, Iraqi Security Forces, and the Kurdish Peshmerga against ISIS, may convince the US and Western allies to develop plans for a new initiative regarding Ukraine. Has Putin Overplayed His Hand on Ukraine? Culpa par odium exigit. (The offense requires a proportional reaction.) The US and European countries no longer appear ambivalent about committing to the requirements of European security, which in many respects can be costly and risky. The success that the US found in rallying the Syrian Democratic Forces against ISIS and other Islamic militant groups, as well as its success avross the border with the Iraqi Army, Iraqi Security Forces, and the Kurdish Peshmerga aainst ISIS, may convince the US and Western allies to develop plans for a new initiative regarding Ukraine. Rather than have talks on the status of Ukraine remain in stalemate at the negotiation table, one could surmise that the US might organize a vigorous overt and covert training and equipping of Armed Forces of Ukraine, particularly the Ukrainian Ground Forces That may in turn give those forces the capability to independently regain territory claimed by the Donetsk People’s Republic and the Luhansk People’s Republic. Kiev may, on its own volition, make use of its new arms and capabilities to do just that with such speed and power that nothing could be done rapidly in reaction. The Ukrainian Air Force could be used in ways to support friendly ground movement that has never witnessed before. Kiev has not recognized the the rebellious movements in Donetsk and Luhansk. It has not recognized the autonomy or the secession of those provinces. As far as Kiev is concerned, the entire territory of the Donetsk and Luhansk provinces are still Ukraine’s sovereign territory. For Kiev, agreeing under the Minsk Agreement that the borders between Donbass and Russia, and border control must be administered by the Ukrainian government reflected its position, its belief. The US has asked Russia to take its forces out of Ukraine and hand Crimea back to Kiev’s full control. The reality is that getting the Russians out of Crimea, at least in the near term, may be impossible. However, getting them out of Eastern Ukraine is another thing altogether. Moscow may be willing to seek some resolution on Ukraine at the negotiation table to halt the total collapse of the forces of the Donetsk People’s Republic and the Luhansk People’s Republic forces and whatever units the Russian Federation might have mixed in with them. Ukraine is delicate issue in the Kremlin, but Putin and his advisers do not appear too far down the road to recurvate on it. It could be hypothesized that the collapse of pro-Russian forces in Ukraine would not play well politically at home. Rather than sit and bemoan the new situation, Putin may have no choice but to respond to it all in a way akin to the US response during the 1962 Cuban Missile Crisis and be willing to invade Eastern Ukraine to retake that territory. Moscow could again use the argument that it must defend ethnic-Russian in Ukraine by request. 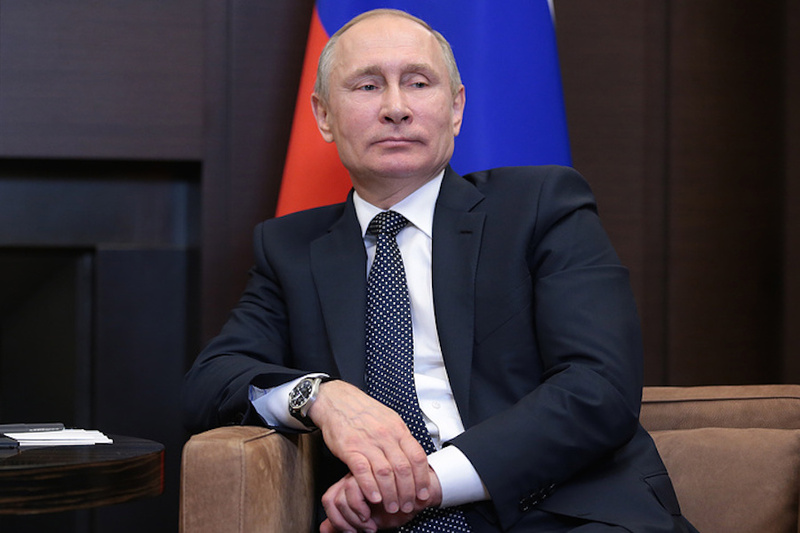 Putin has abstained from more vigorous moves against Estonia, Latvia, and Lithuania. In response to the collapse of the two pro-Russian states, Putin, taking an asymmetric approach, could lash out against the Baltics. Yet, all this being stated, Russia may not be so certain that it could sufficiently respond militarily, extrapolating from what was observed in Syria. 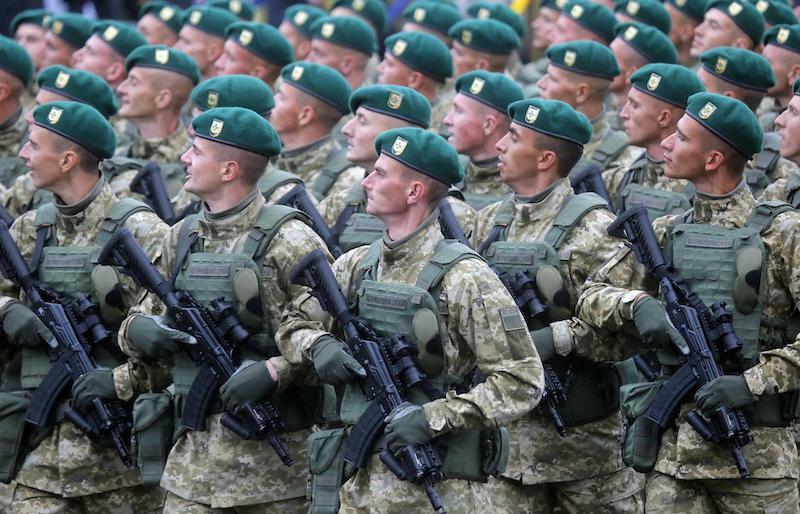 Ukrainian Ground Forces (above). Rather than cope with deadlocked talks on Ukraine, one could imagine the US organizing a vigorous overt and covert training and equipping of the Armed Forces of Ukraine. That may in turn give those forces the capability to independently, on its own volition, retake most or all of Eastern Ukraine now in the hands of pro-Russian separatists with such tempo and power that nothing could be rapidly done in reaction.